The Minutes of the First Conference of the United Methodist Church, held in Wesley’s Chapel, City Road, London, September 1907 contain much useful information concerning the three uniting denominations. 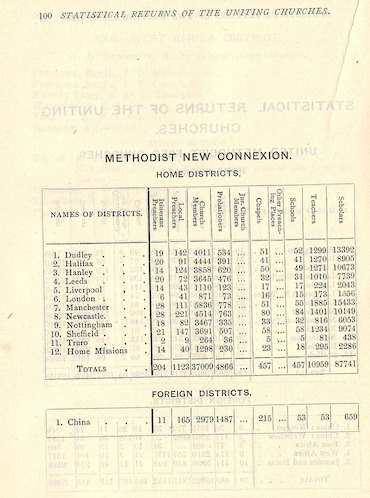 We intend making this document available in the near future, but in the meantime present the statistical returns, as an indication of the strength and reach of the Bible Christians, Methodist New Connexion, and United Methodist Free Churches in 1907. Thanks for drawing my attention to Askew’s Free Methodist Manual 1899. Is there any possibility of a digitised version of what I imagine is a scarce item being made available online. Is there anything similar for the other pre UM denominations? I couldn’t agree more with the two comments made. We have digitised some key works from just after Union. 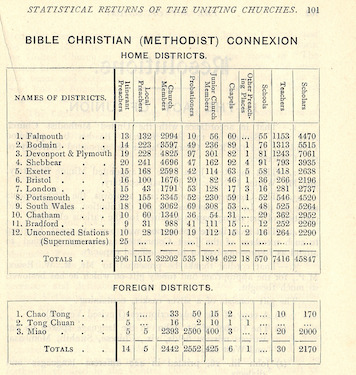 The 1940 Statistical Returns list all the chapels still open and indicate their original denomination, and Who’s Who In Methodism 1933 contains (pp30 onwards) a list of all the Circuits from each uniting church under each new District; but those are just surrogates. We have been able to digitise a number of sources on Wesleyan Methodism held connexionally, and I know the editors of My Primitive Methodists work hard transcribing sources on the PMs, but we do not have any sources on the other parts of Methodism to hand. I would encourage anyone who can find them to make them available. There are links to a number of works on the Bible Christians, MNC and UMFC on the Methodist Heritage website. 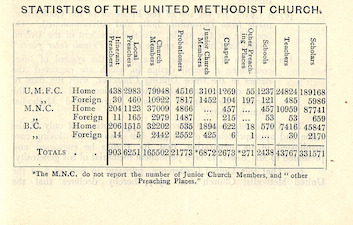 Askew’s Free Methodist Manusal 1899 has on pp 264-277 lists of all circuits and chapels and preaching-houses in the UMFC. This is an interesting document but sadly it does not go down to individual chapels. 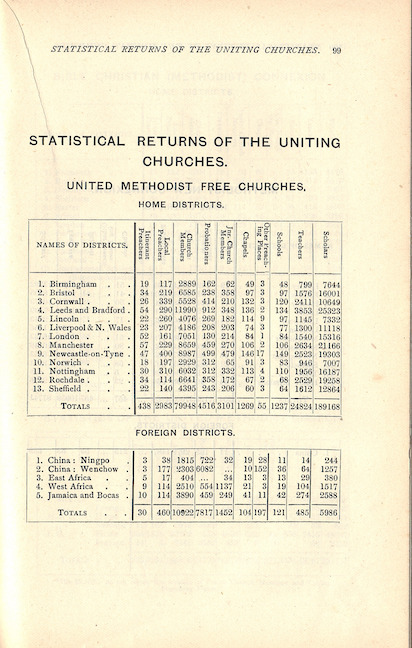 The UMs did carry out a survey of seating accommodation in their churches in 1924. I have found some copies of the returns held locally but it would be useful to know where a full set can be seen, even better to have it digitised an put on line.